1801-1877 German Eduard Gaertner Gallery German painter and lithographer. His father was a master carpenter and his mother a gold embroiderer, and he had his first drawing lessons in 1811 in Kassel, where he had gone with his mother after the occupation of Berlin. After returning to Berlin he became in 1814 an apprentice painter at the Kenigliche Porzellanmanufaktur; and from 1821 he studied under Carl Wilhelm Gropius (1793-1870), then engaged as a painter of stage sets at the Kenigliches Theater in Berlin and also known for his townscapes. Here Gaertner developed skill in the rendering of perspective. He first exhibited at the Akademie der Kenste, Berlin, in the following year. In 1824-5 he was commissioned to paint interior views of Berlin Cathedral (see fig.) and the chapel of the Schloss Charlottenburg (both Berlin, Schloss Charlottenburg). In return, he was granted funds to enable him to spend three years in Paris, where he studied under Francois Bertin. Gaertner views of Paris already show his gift for lighting and use of staffage. His special ability lay in his understanding of the character of a city as the work of its inhabitants. After his return to Berlin he swiftly established himself as the leading painter of urban views, which he regularly showed at Berlin Akademie exhibitions. Interest in this genre grew along with the spate of building activity in Berlin after the end of the wars against Napoleon. There was a fresh interest in paintings of new buildings in particular, intended for a local rather than a visitors market. Two large views of the former Berlin Schloss, The Schleterhof and The Eosanderhof (both 1831; Potsdam, Neues Pal. ), show Gaertner bold use of light and shadow. 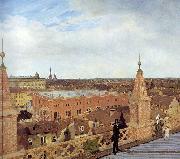 With the six-part panorama View over Berlin from the Roof of the Friedrich-Wedersche Church (1834; Berlin, Schloss Charlottenburg) Gaertner showed the spread of the city by this time. After painting a replica of this work for the Prussian king daughter Alexandra Feodorovna, Empress of Russia, in 1835-6 (St Petersburg, Hermitage), Gaertner visited Russia in 1837, and again from 1838 to 1839, staying in both St Petersburg and Moscow. He completed a large number of city views, including a three-part view of The Kremlin (1839; Berlin, Schloss Charlottenburg), commissioned by Frederick William III. With the death of the Prussian king in 1840, Gaertner lost his most powerful patron and interest in his work began to wane as it came to seem too stiff and objective to Romantic sensibilities. Gaertner tried to adapt to the change in taste, adopting a more painterly approach; in particular, he paid attention to effects of lighting. The vogue for city views had passed its peak, however, and Gaertner turned to landscape painting. Journeys to Prague in 1841-2, through West and East Prussia in 1845-6, and to Silesia in 1848-51 introduced new subjects; but it was architecture rather than setting that most engaged Gaertner attention. At this period he occasionally also invented ideal landscape settings for real buildings, as in the Ruined Monastery of Lehnin in an Imaginary Mountain Landscape (Berlin, Schloss Charlottenburg). Gaertner also produced watercolours of interiors and lithographs of both landscape and city views; but after the middle of the century his productivity in all respects dwindled. 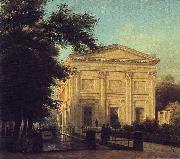 (An example of his work from this period is his oil painting of the Bauakademie and Friedrich-Wedersche-Kirche in Berlin (1868; Berlin, Tiergarten, N.G. ; see SCHINKEL, KARL FRIEDRICH, fig. 2).) The rise of photography appeared to be making the architectural painter redundant.